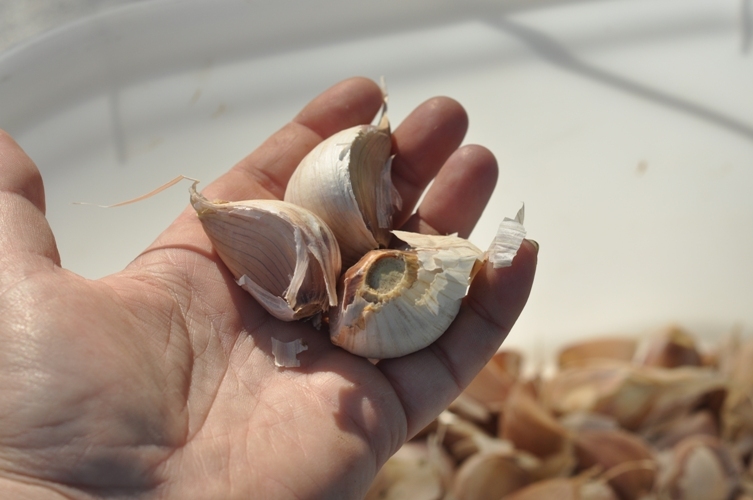 Garlic is a fun and easy crop to grow and now is the time to plant it for any of you who are wanting to harvest your own next summer. A few months ago, we purchased 50 big beautiful heads of garlic at the Gravenhurst Farmers’ Market from Hewitt’s Maple Ridge Tree Farm. These heads were gigantic, healthy, and perfect specimens to plant for next year’s crop. In fact, I wish we purchased more. 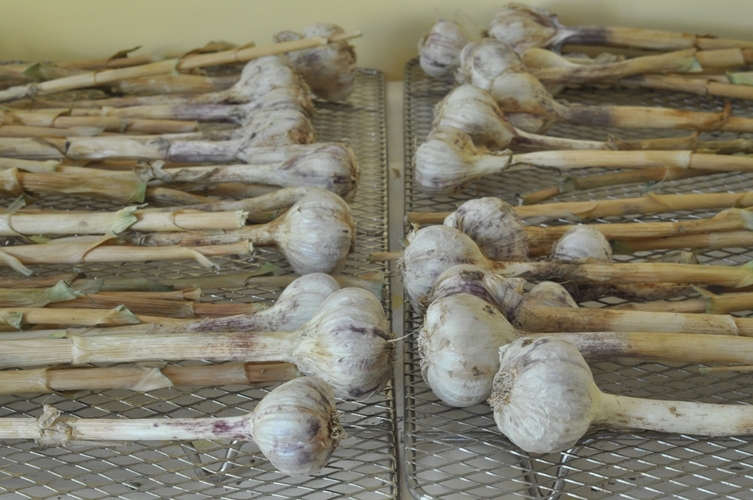 This is our second year growing garlic and we saved the biggest heads from this years crop to add to those purchased. We go through a lot of garlic between every day cooking and canning. 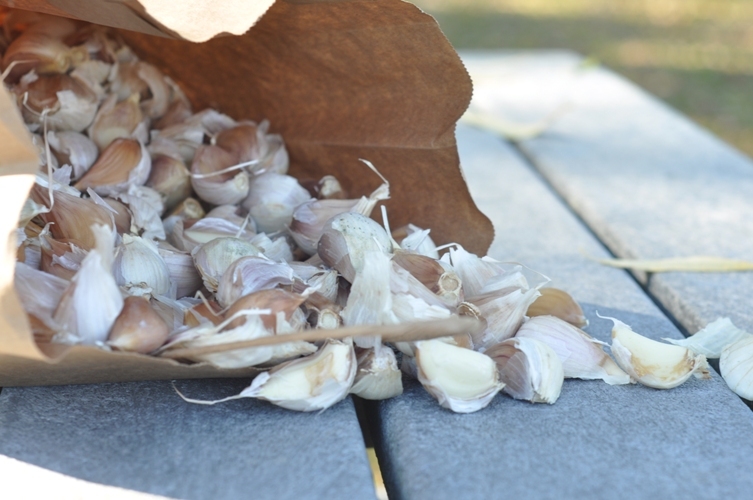 In order to preserve the garlic for both consumption and planting you will need to dry it. We bundled 5-6 whole heads of garlic with butcher’s twine and hung them outdoors in our screened in porch. Drying them is easy as long as you remember to keep them out of direct sunlight and make sure there is an ample amount of air flowing around each one. A garage, shed, or screened in porch are perfect spots to hang the heads. Alternatively, if you don’t have access to an exterior spot, you can lay them out on drying racks in the basement with a fan to continually circulate the air. But, be warned your house will smell like garlic for about a month. So finding the right place to dry your garlic is something to consider. We used both methods; drying our purchased bulbs on the porch and our harvest inside on racks (yes, the place really did smell like garlic and I thought it would never go away but it did). It takes about a month and a half to dry the garlic depending upon your climate. Check the heads occasionally to be sure they are properly drying and that no mold is forming. Once they’re finished drying it will probably be time to plant them. 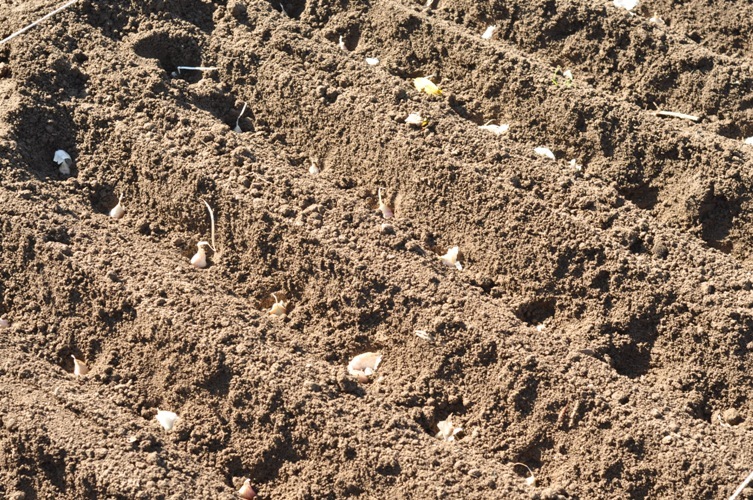 Planting garlic is typically done in the fall about three weeks before the ground freezes. This will allow the roots a chance to develop and the tops should not break ground before the winter snow flies. It’s an easy task and with a few friends doesn’t take long. Break apart the whole heads of garlic separating each individual clove. 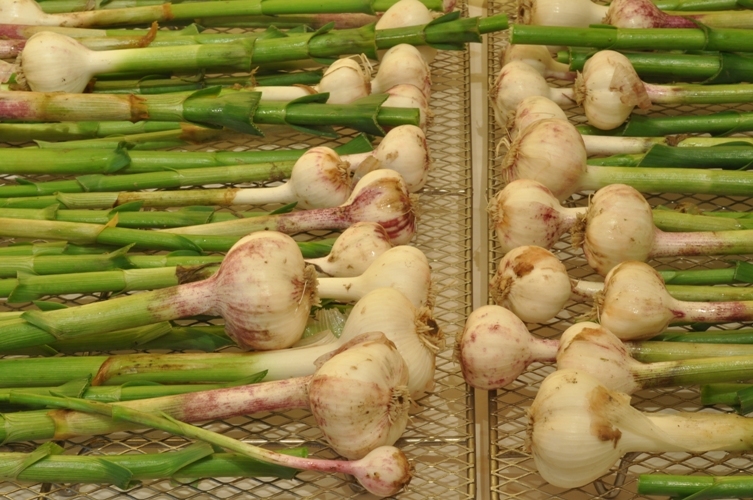 Select well-developed bulbs with a nice shape and the plumpest cloves from each bulb. It is the clove size that will determine the size of the new bulbs. 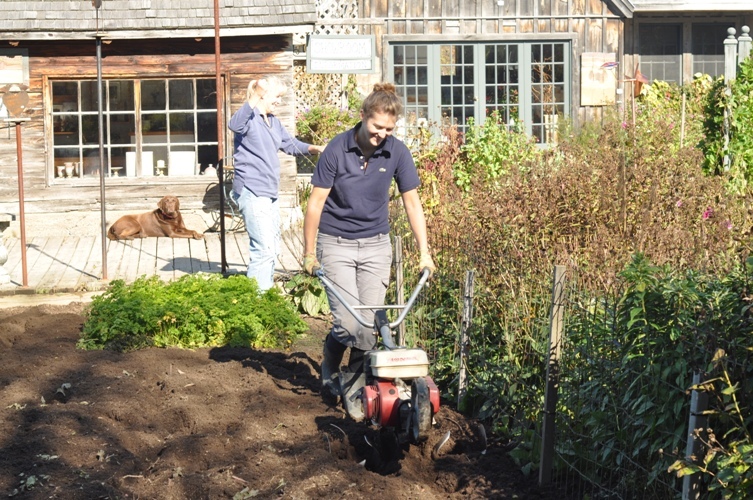 We started by rototilling the soil. It’s important to loosen the dirt to allow the roots a place to grow. So, turn the soil and don’t be afraid to get dirty. We also alternate where the garlic is grown from one year to the next and choose a sunny spot. Create rows approximately 4 inches apart and plant each clove 4 inches from one another about 3 inches deep or the depth of you finger (root side down). Then cover with loose soil mounding over your planted rows about 4″ high. Water and wait for them to do their thing. In the winter, when the ground is covered in a thick blanket of snow and there is no sign of anything green anywhere you may spot the garlic shoots poking out through the snow. Proof they are growing. As the snow retreats and warmer weather takes hold your garlic will develop green shoots known as scapes. At the end of June, these flower heads or garlic scapes were cut in order to divert all of the plant’s energy to growing a larger bulb. 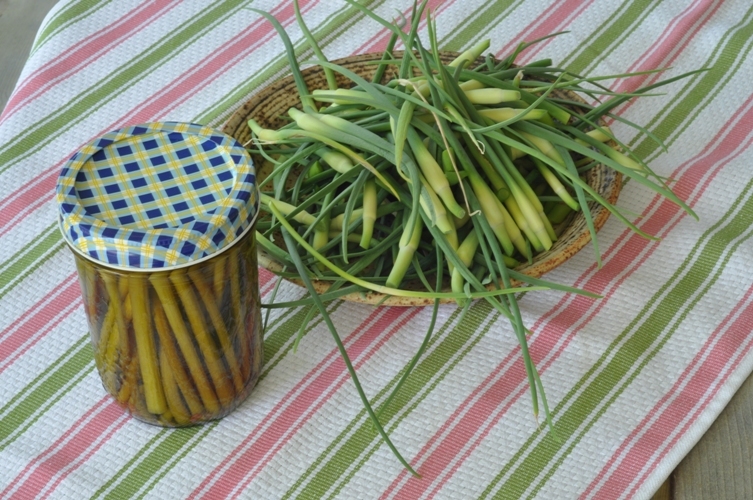 Besides, the scapes are a tasty treat delicious to cook with and/or pickle. We did some this year and find they’re an interesting addition to the pantry. Definitely not to be wasted. By the third week in July the heads should be fully formed and the leaves will start to turn a bit yellow or brown. It’s time to harvest your crop. Reach beneath the soil to investigate whether or not they’re large enough (it’s better to check before harvesting ~ you can always leave them a little longer). If they are about the size of a child’s fist or the size of the whole bulbs from which you started then they are ready. Pull them out and using a pair of sharp scissors cut off the roots on the bottom of the bulbs and cut the stock leaving about 12+ inches. Then it starts all over again. Great post! I also planted my garlic this morning, although it was a mere two 10′ rows of German Extra Hardy (ordered from Seed Saver’s Exchange in 2010 and saved from this summer’s cropped). The hardneck varieties are great in the kitchen because the cloves are so large. What variety do you plant? Another option for home gardeners is to mulch it heavily. Garlic often does best if you layer 6-8″ of leaves/hay over the rows. The variety of garlic we plant is Musik. It grows well in Northern climates and has a good hot flavour. Great info! I’ve been wanting to plant garlic this fall and keep meaning to look into it – Thanks!